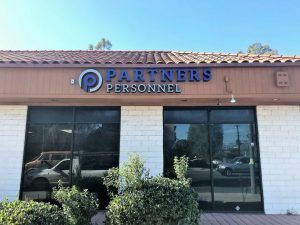 A new Partners Personnel location in North Hollywood, California needed a storefront sign to advertise both in the daytime and nighttime so we made them a channel letter sign. Channel letters are deep, 3-dimensional letters that are hollow so you can put LEDs inside of them for internal illumination. In the photo, you can see that these letters are very large and make a great visual impact. A sign like this is very easy to notice while driving which is great because it’s located on Laurel Canyon, a popular street. When making a channel letter sign, the first thing we look at is the logo. Partners Personnel has an established logo which they wanted to use for the sign. The logo colors are very specific so they called out pre-colored translucent vinyl colors for us to use for the faces. Since these are front-lit channel letters, the faces are translucent so they can light up at nighttime. In order to avoid hotspots, we use 5″ coil for front-lit channel letters. The coils are hand bent by our fabricators in-house to create the returns. Once the returns are created we weld the aluminum backs, install the LEDs, and put on the trimcapped faces. The channel letters were individually installed with screws and anchors flush to the wall. Front-lit channel letters are normally installed flush unless specified otherwise. We have come across a few landlords who prefer them to be mounted with spacers to avoid marks being left on the building from the letters. If you are opening a new location, channel letters are a great option. Along with front-lit channel letters, we offer reverse-lit and compound which is both front-lit and reverse lit. Even if your business is not open at nighttime, having your logo seen all day is great for brand recognition.